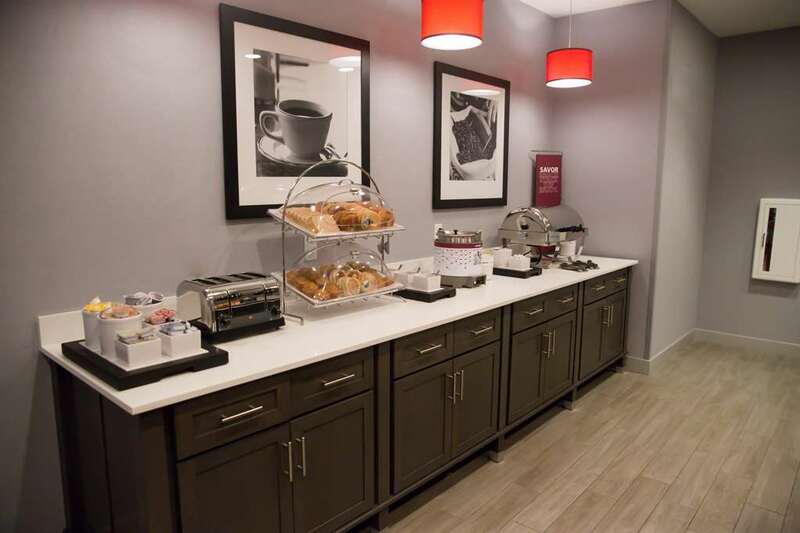 Boasting a convenient location off of Interstate 55 and near historic Route 66 Hampton Inn Pontiac offers easy access to local attractions and restaurants. Route 66 Museum Livingston County War Museum and International Walldog and Sign Art Museum are just a short drive away. Feel at home in your modern guest room with such amenities as microwave refrigerator and free WiFi. Our Pontiac IL hotel welcomes families with children and has an inventory of double queen rooms with sofa beds. We also offer accessible rooms with all the standard amenities plus a variety of accessible features. Enjoy free hot breakfast buffet daily /600am 1000am/ including freshly made waffles oatmeal fresh fruit and a variety of hearty hot selections. This Pontiac hotel also has an on-site 24-hour Suite Shop stocked with snacks beverages and sundries. Make sure to stop by the Front Desk for some tips on restaurants and bars. Reenergize in the fitness center with cardio strength training and balance equipment before plunging into an indoor heated pool. Host your briefing training or small gathering in our meeting room accommodating up to 25 people with outside catering options available. Make finishing touches to your presentation in a business center.